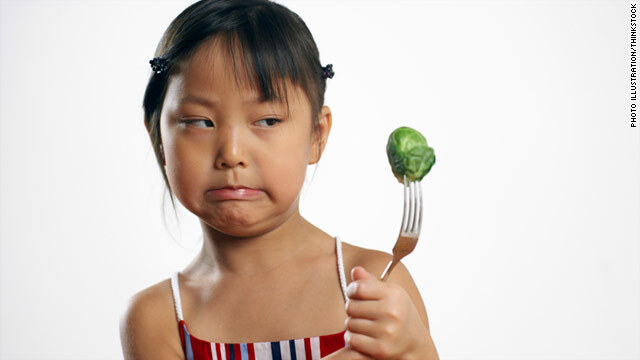 Start calling Brussels sprouts "hero buttons" and your kids may decide they're OK.
(CNN) -- As a parent, you might look at the government's new nutrition icon and think, "Really?" The image is a dinner plate divided into sections. Half the plate is full of fruits and vegetables. That's right -- half of what your child eats is supposed to be fruits and vegetables. Not hot dogs, not hamburgers, not chicken nuggets, but broccoli, squash, Brussels sprouts, and other things that come from the ground. "It's extremely tough to get your child to eat half a plate of fruits and vegetables," says Jessica Seinfeld, author of two books on cooking for kids. "I've talked to thousands and thousands of parents, and most of them can't get their kids to try them." Statistics show kids aren't getting nearly enough fruits and veggies. Only 22% of children ages 2 to 5 meet government recommendations for vegetable consumption, according to a 2009 study by researchers at Ohio State University. It only gets worse as children get older: Just 16% of children ages 6 to 11 meet the government's guidelines, and only 11% of those ages 12 to 18. In the study of more than 6,000 kids and teens, about a third of vegetable consumption was fried potatoes (potato chips, french fries, etc. ), and a little more than a third of the fruit consumption was juice -- so if you don't include those, the percentages get even lower. There's no one way to get your kids to eat more fruits and veggies, but here are ten tips straight from moms. 1. Get them while they're hungry. From Dr. Ann Kulze, family physician, author of "Eat Right for Life," and mother of Liz, 21, Frazier, 20, Jack, 19, and Lucie, 16. If they're hungry, they'll eat. Before dinner, serve an appetizer of colorful vegetables, such as carrots, cucumbers, and red bell peppers, along with a hummus or low-fat salad dressing, Kulze suggests. 2. Institute the "no thank you bite" rule. From Amy Traverso, Yankee Magazine's lifestyle editor and mother of 3-year-old Max. Tell your child he has to take a bite before vetoing something on his plate. "We figure as long as our son is tasting the food, he'll eventually get comfortable with it," Traverso says. "It works pretty well." 3. Make up cute names. From Susan Risdal, an administrator with an IT company and the mother of C.J., 38, Cedric, 36, Dan, 30, and Lars and Rebecca, 26. She's also grandmother of Theodore, 7, Alexander, 4, Jess, 2, and Jaxon, 2 months. Marketers do this, so why shouldn't you? Once Risdal started calling Brussels sprouts "hero buttons," her kids couldn't get enough of them. 4. Shop with your kids. From Eileen Wolter, who writes a blog called A Suburban State of Mom. She's the mother of 6-year-old Luke and 3-year-old Graeme. "Let them pick out the fruits and vegetables," Wolter says. "Let them smell the produce and admire the colors." 5. Cook with your kids. From Shannon Duffy, mother of Dakota, 15, and Dylan, 9. A few years back, Duffy asked Dylan to make the green beans -- add some butter, sprinkle on some seasonings -- while she worked on other dishes. "When we sat down to eat, Dylan insisted on eating the green beans because, as he put it, 'I made them.'" Two years later, he's still eating his veggies as long as he helps prepare them. 6. Have a "veggie night." From Mia Redrick, who has her own blog, Time for Mom-Me, and is mother of Patrick, 13, Alexandra, 9, and Matthew, 6. This way, there's no competition from other types of foods. "Serve up edamame, hummus with veggies, mushroom burgers with Swiss, etc.," Redrick suggests. From Jessica Seinfeld, author of "Deceptively Delicious," and mother of Sascha, 10, Julian, 8, and Shepherd, 5. In Seinfeld's book, she tells parents how to stealthily sneak pureed vegetables into everything from shrimp dumplings to quesadillas. 8. Make fruits and vegetables the easy option. From Coco Peate, blogger at vidacoco.com, and mother of Sophia, 7, Maddy, 5, Danny, 2, and 2-month old Anthony. Take a tip from the geniuses who thought to put potato chips in single-serving bags. Stock a kid-accessible shelf in your fridge with little bags of cut fruit and vegetables, applesauce, and fruit cups. 9. Let them use fun gadgets. From Althea Hughes Wills, blogger at Raw Mocha Angel. What kid doesn't love gadgets? Let them use a blender, juicer, and food processor to make smoothies and other recipes with fruits and vegetables. Use proper supervision, of course. From Natalie Boecker, marketing executive, mother of Ali, 27, and Pam, 23. "Didn't want to finish what was good for them? No problem -- no dessert," Boecker says. "Maybe not the healthiest way to get them to eat vegetables, but it worked for us."